The F-150 has been Ford’s best-selling truck for almost thirty years running, so it's only fitting that the JL Audio design team create a Stealthbox® to accompany the newest model. This powerful ported subwoofer system installs under the rear seat and fills your truck with deep, rich JL Audio sub-bass performance. A powerful, down-firing 10-inch JL Audio subwoofer combines with a side-firing port to deliver outstanding output and deep bass extension. The Hard Data: Contains one 10W3v3-2 subwoofer in a ported enclosure. 500 watt power handling. Wired for 2 ohm mono. Installs under the driver side rear bench seat and may raise the seat base slightly. Also fits '06-'08 "Harley-Davidson" and '05-'14 "King Ranch" editions. May require relocation of the jack and removal of the jack mounting assembly for installation (which also opens up space for amplifier installation). Does not affect seat-folding functionality. Please Note: “Black (leather)”, as indicated in the chart below is the OEM color/material. 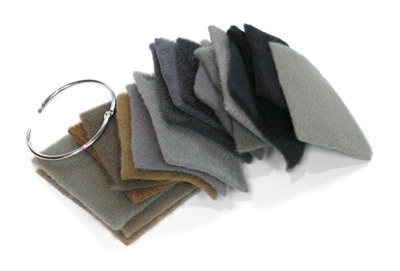 The Stealthbox® model that matches that OEM color is carpeted.